Chimney Sweeps in Oxfordshire, Gloucestershire and Wiltshire. Peacock chimney services is owned and run by Richard and Joanna Peacock. They are both professionally trained and qualified by the National Association of Chimney Sweeps (NACS). Richard is a qualified Wood and Multi-Fuel Stove installer approved by HETAS and is also a HETAS approved chimney sweep. 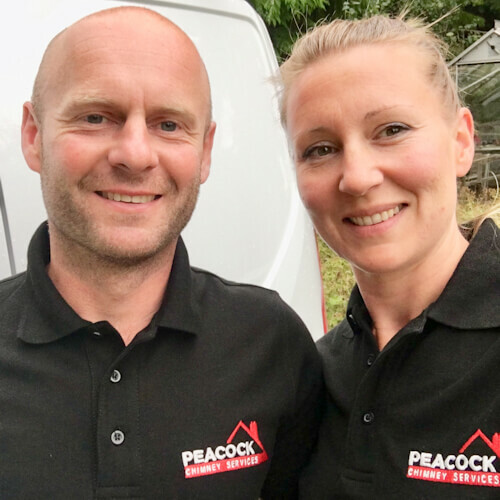 As well as being passionate about all things chimney, Richard is also a trained Fire-fighter and has experienced first hand just how important a safely installed and maintained appliance can be. You can be assured you will receive the highest standards of service from a friendly and knowledgeable team and we pride ourselves in leaving every property as we find it and take great care and respect of your home. We cover parts of Oxfordshire, Gloucestershire, Wiltshire and West Berkshire. We offer a wide range of specialist services which include, wood burning and multi-fuel installations, lining of chimneys, power sweeping, traditional sweeping, supplying and installing chimney pots, caps, cowls and bird guards, removal of blockages, CCTV inspections and more. To view a comprehensive list of our services, please view our services page. We are a fully insured company and can boast 5* customer reviews. We are fully affiliated with the National Association of Chimney Sweeps and provide official certificates that are recognised by insurance companies. We pride ourselves in using the most up-to-date technology to deliver the most effective and professional chimney sweep service to all of our customers.